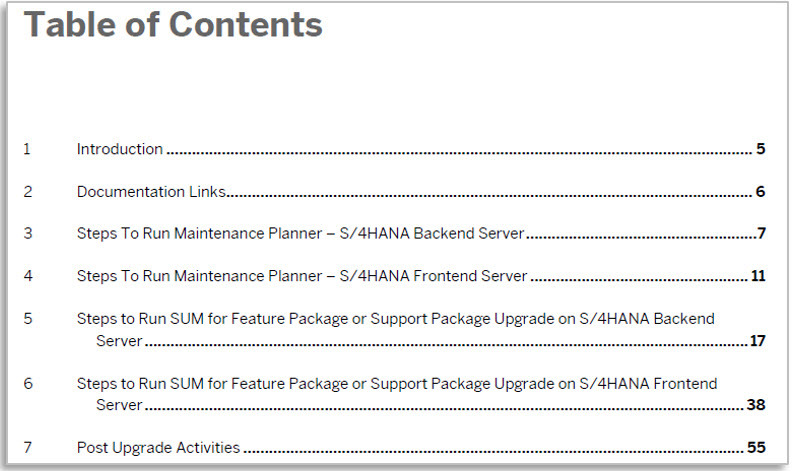 If you have installed or implemented SAP S/4HANA 1610 for your project with initial shipment and would like to upgrade the SAP S/4HANA Frontend and Backend servers from initial shipment to Feature Package 01, this document will provide you the steps to conduct this upgrade. In this document, it will go through step by step on 1) Maintenance Planner on planning a maintenance and generation of the stack file, 2) Running the upgrade with Software Update Manager (SUM), and 3) Post upgrade activities required. Also, note the steps are captured for an upgrade to SAP S/4HANA 1610 FPS01, but it can also be used to conduct upgrades of follow on FPS/SPS stack level too. Here is a glimpse of the table of content. I was looking for a document for feature pack upgrade of SAP S/4 HANA from 1610 initial shipment to FP02 but the link you have provided is expired. Can you please share it again? Unable to access the link which you have provided in the blog. Getting error like “Share is no longer available; contact the owner if you need access”. can you please share it again ..? The document is made available again. a) When we update the S4 1610 backend from say FPS01 to FPS02 – DO we HAVE to (mandatorily) update also the S4 Fiori frontend ? b) I assume the answer two a) is yes. If yes, which parts of the Fiori Front End would need an update? only the SAP FIORI for S/4 HANA 1610 ? or also the Fiori Front End server (SPS) ? c) how about viceversa. Would there be cases were a certain S/4 HANA Fiori UI would need an SP without having to update anything on the backend. I assume yes. Is this a common and recommended approach or is it advised to only do a complete SPS update on the fiori front end server? d) does the concept of FPS apply to Fiori Front end server also ? or does it only apply for S/4 backend and on the Front End its only SPS and not FPS? First you select ‘Update SAP Netweaver’ and select SPS01. Why ? Why is it not setup in same way like S/4 backend where you select S/4 1610 and choose FPS02 and it automaticlaly updates the underlying SAP Netweaver also? Continuing with the same question above, why do we choose only SPS01 here. is there any version equivalancy ? Like we chose FPS01 for S/4 backend so on the frontend it can only go till SPS01 ? Is there any note that explains this version dependency? and finally in steps 9) and 10) of section 4 – its not clear why we choose again only SPS01 within FP1 ? Is there any documentation explaining why we should not choose say SPS02 ? Here in this case perhaps SPs01 was the latest released but if there were more, would maintenance planner allow us to choose whichever SP we want? Is there no note explaining what is the right option and version dependency? The link you have provided is expired. Can you please share it again? I have updated the link to the document. Please try again.